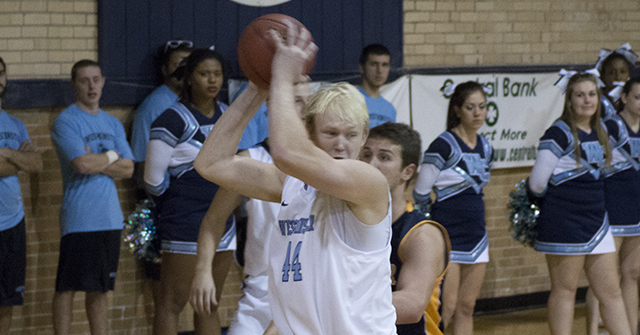 The Westminster men’s basketball team opened conference play with a night game against Webster University. The Westminster Blue Jays dropped the game 71-53, giving them a 1-4 record and 0-1 record in conference. Webster came out with a quick 4-0 lead to start the game. Junior Brandon Moore the Blue Jays on the board with a free throw. The Gorloks extended their lead to 8-3, but freshman Tanner Cochran made a three to bring the Blue Jays within two, 8-6. Back-to-back baskets by juniors Kellen Brondel and Matt Murphy gave the Blue Jays their first lead of the game, 10-8. The two teams continued to battle back-and-forth for the rest of the first half. 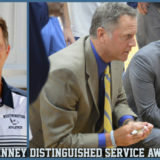 Moore contributed two consecutive three-pointers with assists by junior Jayson Saldana, bringing Westminster’s deficit to 22-18. Saldana put up a three-pointer to conclude the first half with the score 30-25, Webster. The Blue Jays came into the second half ready to play, and they quickly closed the gap to 30-29 after two free throws and a steal by sophomore Tanner Gentges. The Gorloks responded and extended their lead, 40-32. Westminster continued to fight with their rivals. Brondel and Murphy each put in two more baskets, making the score to 47-39. Webster continued to pull ahead in the last five minutes of the game, ending it 71-53. Murphy and Brondel led the Blue Jays with 10 points each, while Cochran led the team with 5 rebounds. The Westminster men’s basketball team travels to Greenville, Illinois to continue conference play against Greenville College on Saturday, December 6th. Tip-off will start at 3:00 p.m.